Aluminum alloy injection molding (AIM) is a new type of aluminum alloy forming technology. It is similar to metal injection molding (MIM) technology, which is the main branch of powder injection molding (PIM) technology. It is developed from injection molding technology and will be the fastest growing and most widely used near-net-shape processing technology of aluminum alloy parts in the world. Metal injection molding (MIM) is to uniformly mix the powder and the binder, and then the mixture is granulated by a granulator and then injected into a forming mold cavity to complete the desired shape. The mixed melt has good fluidity after heating, which aids in the forming of the product during injection and maintains the density uniformity of the product. The shaped product also needs to be degreased and then sintered in a sintering furnace, and some products need some post-treatment such as tapping, polishing and coating. However, a problem arises if aluminum is used, as the oxide layer surrounding the aluminum particles can only be removed at extremely high temperatures. 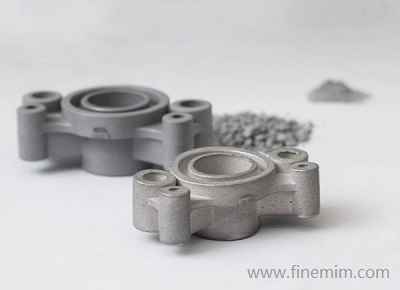 At the same time, aluminum has a relatively low melting point, which restricts the maximum sintering temperature. It is therefore impossible to remove the oxide layer on the aluminium powder before the entire metal piece has melted. The binder material, which bonds the metal powder in the MIM feedstock, is also removed by thermal processes, which only occur at increased temperatures. The overlapping of the temperature ranges for binder removal and sintering means that residues of the binding agent are incorporated into the sintered workpiece if aluminium is processed using the same technique as for other metals. A solution to this problem has been succeeded in finding now. The key is in creating the correct atmosphere in the sintering furnace. A low-oxygen environment is usually used to prevent the complete oxidation of a metal powder. By contrast, with aluminium, an oxygen-rich atmosphere has been found to be beneficial. The aluminium oxide layer of the particles is so thick that the particles are protected from complete oxidation. At the same time, the oxygen aids the combustion of the carbon contents of the binder material. After this first step, the oxygen atmosphere is replaced by nitrogen and the temperature is increased further. With the additional help of magnesium, the aluminium oxide layer is finally broken and reduced. A liquid phase occurs and the aluminium particles are sintered to form a solid metal piece. This method allows to separate the two process steps; the removal of carbon residue and the sintering of the aluminium particles, thereby enabling both steps to run to completion for the first time. The Powder Injection Molding process enables complex shapes to be manufactured, which cannot be realised in any other way, or only with great effort. The aluminium powder is relatively inexpensive, which means that even large components, by MIM standards, can be produced at a reasonable cost. In mass production, savings of up to 50% can therefore be expected on materials and weight compared with conventional production. This advanced technology is suitable for the production of large-volume, complex parts, including some extremely complex three-dimensional shapes, and the products produced do not require machining or only a small amount of processing, which greatly reduces the production cost and greatly improves the work efficiency. Since the injection process is performed under precise temperature and pressure, the formed product has extremely high precision and a very uniform density. Aluminum alloy injection molding technology can process and produce extremely complex parts, with a minimum of 0.1g of small parts; the products has uniform structure, high accuracy and smooth surface; Moreover, the product quality is stable and the production efficiency is high, which is suitable for mass production. Because aluminum alloy injection molding has incomparable advantages in accuracy and efficiency, the low density of aluminum makes it of particular interest for many applications, it has been applied in many industries such as navigation, aviation, machinery, automobile, precision instruments and so on. With the continuous development of machinery industry, AIM has become the fastest growing near-net-shape processing technology of aluminum alloy parts in the world, and has been favored by more and more industries, where weight reduction is important.